Register/Transfer domains with Resellers specific contact details for admin/tech/bill (Setup » Generall Settings » Domains) implemented. Bugfix: Running unnecessarily API calls if a previous error has been thrown. It now shows the correct API error. Implemented Activitylog if a domains nameservers got changed. Implemented automatic EPP Code generation if the EPP code does not exist or if string is "secret"
Minor Bugfix: Passing extra info for non resident customers while registering .ES Domains fails with error message "Please specify Type of Identification"
Implemented: Pending Transfer shows now the transfer status instead of "Website doesnt exist"
All v3 Modules requires the Resellerclub Mods Management Core Console Addon "Resellerclub Mods Console v3". Download the Addon from the product license details page TAB "Download" and install first this Addon. If already installed, make sure you run version v1.6.0 or greater. Visit the install instructions for the ResellerClub Mods Management Core Console Addon if you havent the Addon installed/updated. Once installed/updated and configured your reseller credentials as well as the product license, go ahead with the Module Installation in STEP 2. If you use WHMCS 7.x.x, upload the folders "modules" and "resources" into the whmcsroot/ folder. If you use WHMCS 6.3.x, upload the folders "includes" and "modules" into the whmcsroot/ folder. If you followed the instructions from STEP 1, then you will see something similar to the following image. Click the save changes button and you are ready to use the Registrar Module. You can now test the Registrar Module by simply changing the registrar module for any registered domain from the Admin Area Domain details page. 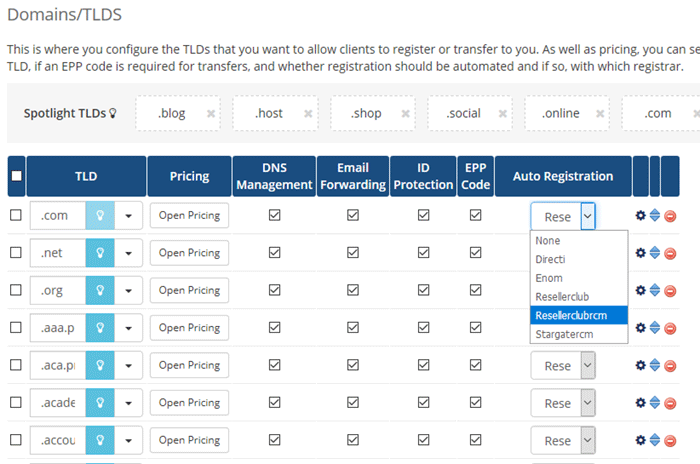 You can do this with phpMyAdmin and a simply SQL update Sentence or with our RC & LB Tools v2 Addon Utility » "Manage TLD's & Domains" to change the registrar module for TLD's and Domains within seconds. Begin by copying one of the standard template folders located in /whmcsroot/modules/registrars/resellerclubrcm/tpl/ and change the copied folders name to the same name of your whmcs template folder name. For example, if the active template folder is named "custom" and the same is based on the "six" theme, then copy the six folder and name it with the same whmcs template folder name: "custom". Goto WHMCS » Setup » General Settings » TAB "Domains" and tick the checkbox "Allow IDN Domains"
Upload the template file back into the active shopping cart orderforms template folder. The following instructions explain how you have to modify the WHMCS template file "clientareadomaindetails.tpl". Upload the template file back into the active template folder. 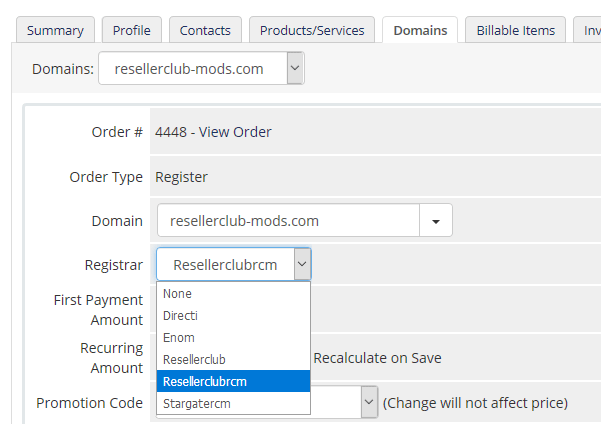 Goto Setup » Addon Modules » Resellerclub Mods Console and click the button "Configure". Tick the checkbox "New gTLD Premium Domains"
Goto Setup » Addon Module » Resellerclub Mods Console and click the button "Configure". 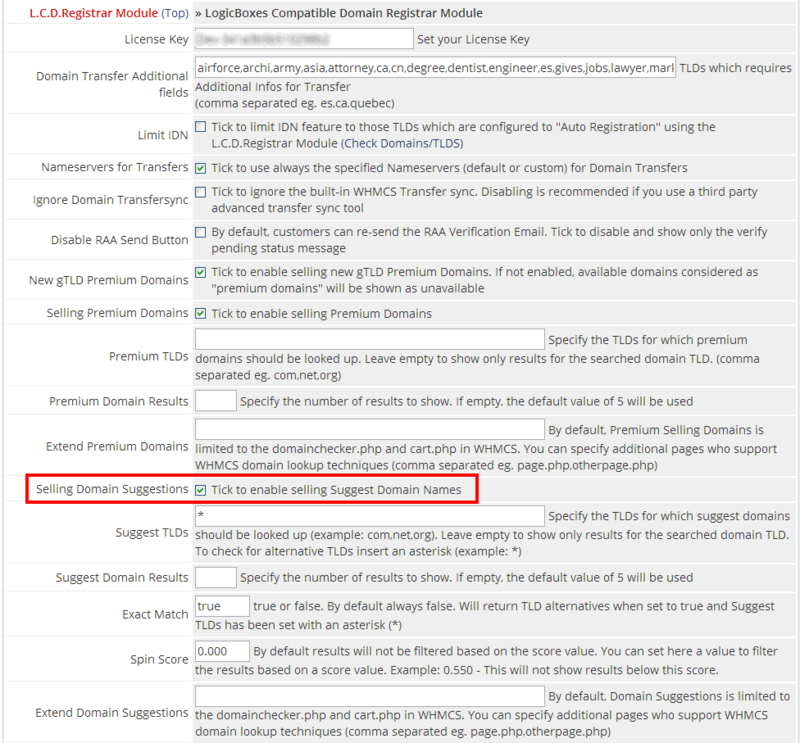 Tick the checkbox "Selling Premium Domains"
No further modification required. Just apply the template modification as described in "New gTLD Premium Domain Support"
Upload the template file back into the active shopping cart orderfoms template folder. 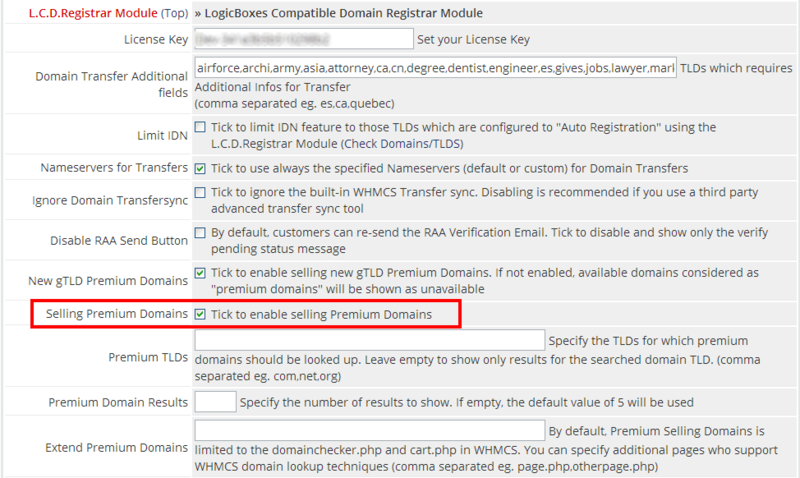 Tick the checkbox "Domain Suggestions"
The following instructions explain how you have to modify the WHMCS template "domainchecker.tpl". Only one small addition must be made to implement Suggest Domains. The following instructions explain how you have to modify the WHMCS orderform templates to add the same support for the shopping cart. Only some small addition must be made to implement Suggest Domains from within the shopping cart order template. Goto Setup » Addon Modules » Resellerclub Mods Console and click the button "Configure" and then click the navigation section link "L.C.D.Registrar Module". The following instructions explain how you have to modify the WHMCS orderform template domainregister.tpl from the standard_cart theme to add new gTLD Premium Domain support for the shopping cart. Select from the dropdown menu "Domain Lookup" your Domain Registrar. This should be your main registrar if you use multiple LogicBoxes Registrars at the same time. The following instructions explain how you have to modify the WHMCS orderform template domainregister.tpl from the standard_cart theme to add Afternic Premium Domain support for the shopping cart. The following instructions explain how you have to modify the WHMCS orderform template domainregister.tpl from the standard_cart theme to add Domain ame Suggestion support for the shopping cart. Why would I need to disable selling ID Protection Addon for Domain Transfer purchase? A domain name can be transferred years before expire date. However, renewal with selling Transfer is limited to "one year" only. If a customer purchase the transfer, let us say on 1st October 2014 and the domain is still valid till 1st October 2016, then one year will be added to the expire date. The new expire date will be set to 1st October 2017. At this point, everything is fine, you charged your customer for one year and your Registrar charged you for one year. The Problem: If the customer purchase this transfer with the ID Protection Addon, you will charge him for "one year" but your LogicBoxes Registrar will charge you the ID Protection service till the new expire date, 1st October 2017. While your customer has paid the ID Protection service for one year, you will be charged for three years! Limit IDN: You can limit the IDN feature to those TLD's which are explicitly configured to auto register with the Registrar Module. Premium TLDs: Specify the TLDs for which premium domains should be looked up. Leave empty to show only results for the searched domain TLD. (comma separated eg. com,net,org). Disable ID Protection Invoicing: Tick to disable invoicing for the ID Protection Addon. This is especially useful when you offer free id protection and do not want the system to generate an invoice with a zero amount. 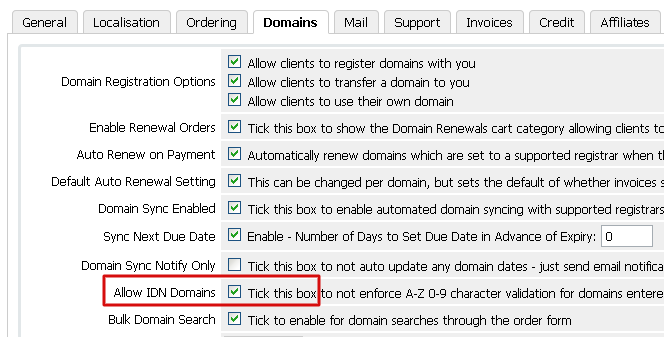 Disable Dns Management Invoicing: Tick to disable invoicing for the Dns Management Addon. This is especially useful when you offer free Dns Management and do not want the system to generate an invoice with a zero amount. Disable Email Forwarding Invoicing: Tick to disable invoicing for the Email Forwarding Addon. This is especially useful when you offer free Email Forwarding and do not want the system to generate an invoice with a zero amount. If you have already installed L.C.D.Registrar Module v3, then you can easily upgrade to ANY new version very easy. Download the latest L.C.D.Registrar Module Software from our Client Area. 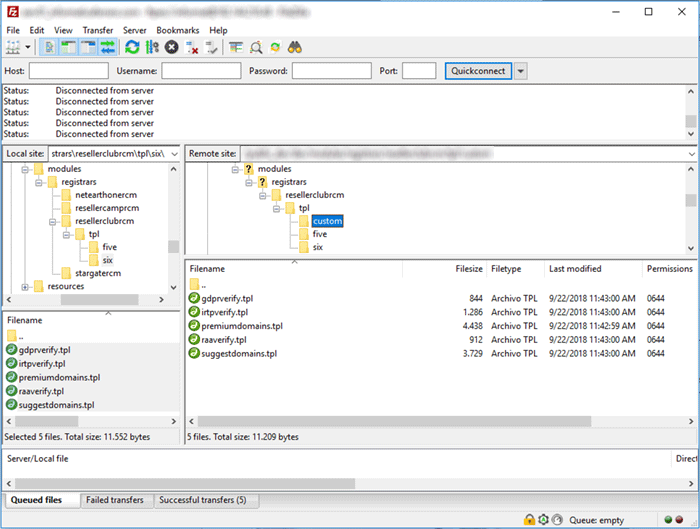 Unzip the file with your prefered decompresion software or use the built-in windows feature to extract the content of the zip file. Proceed with the upgrade steps provided for the version you have installed by clicking on the corresponding "TAB"